ADJOINING TRIBUNE TOWER (the lower stories of which appear at the right in the architect’s model reproduced here) a new broadcasting studio is to be erected for the Tribune’s radio station, W-G-N. Work will start immediately on the new structure, which will be ready for occupancy June I, 1935. THE NEW HOME of W.G.N. which will be constructed of Indiana limestone, will contain one large studio seating 600 guests, dnd in addition several smaller studios. The new building wiII constitute the second step in the development of Tribune Square. ERECT DERRICK FOR WORK ON W·G·N STUDIO. 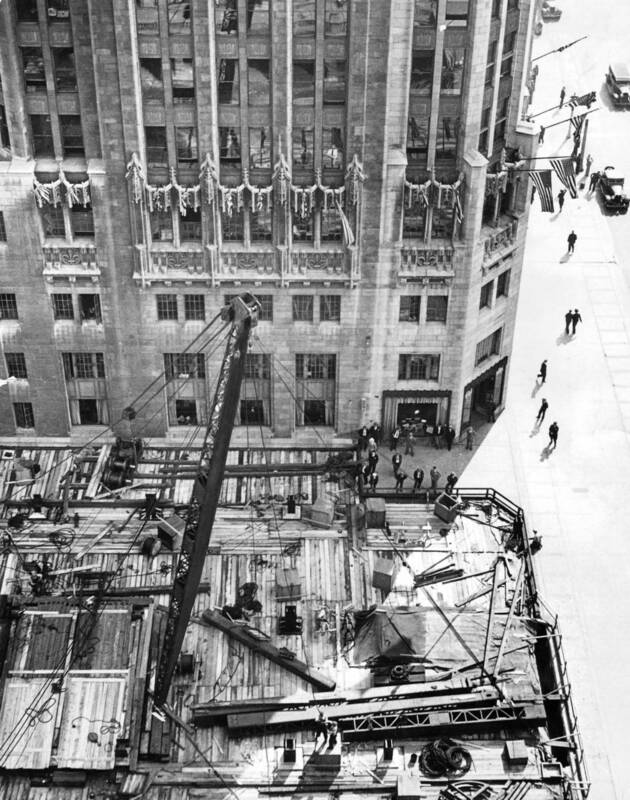 View from the 15th floor of the Medinah club showing workmen swinging derrick into place at site of radio station just north of The Tribune Tower. Steel framework for the new WGN studios as it neared completion. An American flag was unfurled when the highest point on the steel construction was reached. The building is located just north of the Tribune Tower. Enter it any time from 10 o’clock this morning till 2 this afternoon for the public preview that marks completion of one of the most intricate and exacting achievements during the last decade of American architecture and engineering. The Tribune’s new radio building, just north of Tribune Tower, is finished after 276 days of intensive toil by 550 engineers, artists, and artisans, and after the expenditure of half a million dollars. In writing about radio one does not say that anything is “the last word in radio,” but this newspaper does sincerely believe that its Gothic radio structure and equipment are the up-to-the-minute words in radio and that they will reward inspection by you. The preview—accompanied by music, and admittance to which will be by ticket applied for in advance—will be repeated tomorrow and on Tuesday and Wednesday from 10 o’clock in the morning till 2 in the afternoon. And so again we invite our friends to fairyland. A fairyland of music, of discourse, and of color; laboratory of miraculous-seeming inventions, devices, contrivances, and gadgets that utter radio’s up-to-the-minute message. (And if that sounds like o’er zealous ballyhoo it is nevertheless the exact truth). 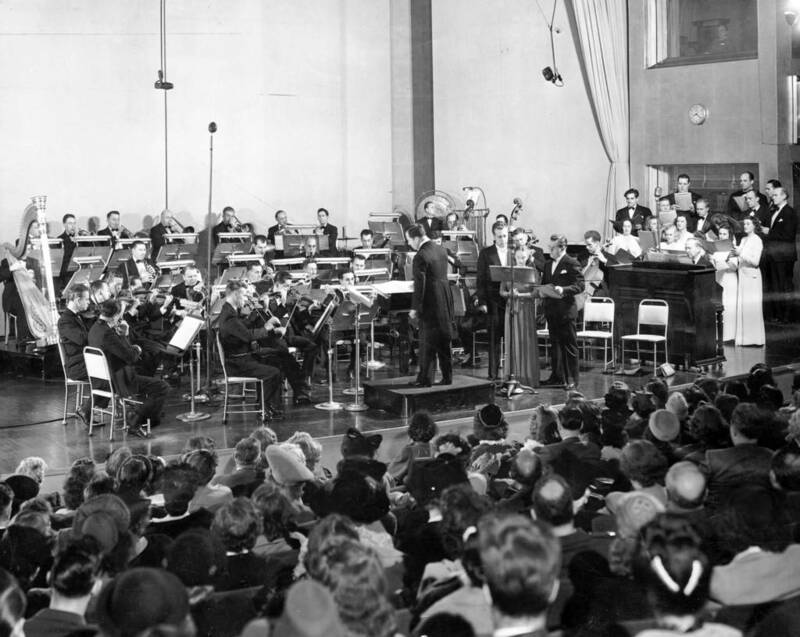 Notables of radio will not only be heard but seen on a platform so large that it will accommodate an orchestra the size of the Chicago Symphony. All these platform programs will be carried by huge concealed amplifiers and transmitters to the outside world—into, in other words, your home wherever in the United States you dwell. In addition to the main studio—or “public observation room,” as it is also called—there are in this radio palace of Bedford stone two more studios that are open to the public when it wishes to enjoy an especially intimate experience in seeing and hearing radio’s wheels go round. One of them seats 22 persons, the other 18. Thus we have for our guests a total seating capacity of 628. Always these “visible shows” will be free from the time you step in from Michigan avenue—no admission fee, no tipping at the receiving windows of the spacious checkroom, no charge at the numerous public telephones. Ten uniformed ushers and pages in dark blue coats, with silver buttons and powder blue trousers will look after your comfort. The 25 members of the principal orchestra will wear uniforms of white and black. In short, fairyland run like a well ordered club. You will hardly believe how large a staff is busy in the graystone palace that covers one-fourth of a city block. Counting everybody—directors, artists, production men, operators, electricians, carpenters, firemen, guards, ushers, and hostesses—from 150 to 200 persons will be on duty when the plant is going full tilt in its total of three public and three private studios. 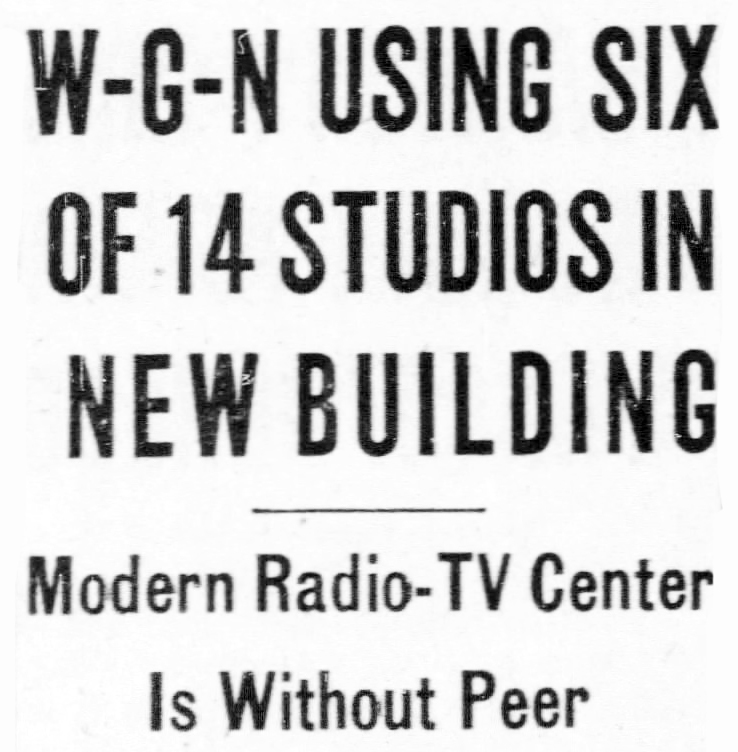 And in addition to those six, W-G-N will continue to maintain its three studios now housed on the eleventh floor of Tribune Tower. Gift to Readers and Listeners. About that matter of free admission—it will be free to the last penny. It will be by ticket, and after application for them the tickets will be mailed free of charge to your home. Details about that further on in this article. Suffice to say at the moment that W-G-N’s new radio home will also be the people’s radio home always free to the people—The Tribune’s gift to its readers and listeners. When you take your preview this week—the first of what we hope will be many visits—a dozen phrases of description will come to your lips. Especially will the lighting bewitch you. Now it is as soft as flute music, now as strong and bold as the rand diapason of an organ. ‘Tis a palette of light, you will say; a jewel box of color. Rainbows while you wait! 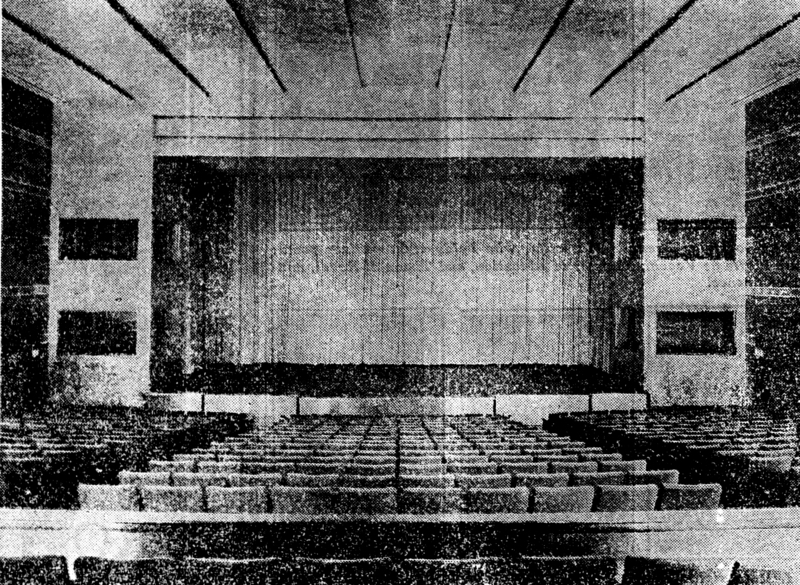 When the full glow is on you will think of the large “public observation hall” in your radio home as the sunshine chamber and, leaning back in your deeply upholstered chair—which is much wider than the ordinary run of auditorium seats—you will be pretty content with the picture. For the place is not fussed up with decoration. In the simplicity of the lines it is in good modernistic style—reticent but neither austere nor angular. Built like a jewel box—inlaid woods, gleaming metal, and rich tapestries—though the interior is also as strong and as intricate as a battleship. At first glance you find chamber after chamber, lobby after lobby, corridor after corridor as simple as a modernistic drawing room and, when the lights go on, as beautiful as a garden in full bloom. But the more you prowl around the more you get the feel of a vast machine shop—a place pulsing with dynamos and whispering with delicate mechanisms. Those last were the things that astounded me and laid humility upon me. I could not always understand them, but I could appreciate the effects they created and could see that they must have cost a heap of money. Before taking two afternoons to go over the plant I could not see how half a million could be spent on four floors of radio and I suspected that my shopmates were drawing a long bow when they declared that such was the price of perfection. To talk of the cost of a great project may be vulgar, but it is news, and the news here is that not only has the sum of half a million dollars gone into W-G-N’s temple but that the total will run to nearly $600,000. The result is a laboratory of observation for scientists, a seat of instruction and entertainment for the people, and a dramatized newspaper. In this setting you shall hear the voices of kings and comedians, presidents and prelates, industrial magnates and men of letters, scientists and pugilists, singers and explorers. And all of those you shall from time to time see in person when they mount the platform for one of the visible shows—all except the kings, they are traveling much nowadays lest their thrones slip from under them. The interior of the structure is from designs by John Mead Howell—son of the great limner of American life, William Dean Howells—and the lamented Raymond Hood, architects of the Tribune Tower, and by their associates, J. Andre Foulihoux and Leo Weissenborn. It is a cascade of “frozen music” which, ’tis said, is what great Gothic architecture should be, and the cloister connecting it with the tower is charming. The exterior instantly stirs the imagination because the building which, by its comprehensiveness and its ingenuity, makes history in a new art also utters in stone a story of the ages. This is the result of our chief’s ardor in bringing momentous history intimately home to the people, especially to children. Embedded in the limestone of the building are stones and a bronze that voice architectural and national annals of 5,600 years. Here is a big block from the Great Pyramid of the year 3700 B.C. And yonder is a bronze panel from the “Holy Door”—A.D. 1900—of St. Peter’s, Rome, with the papal arms and the date engraved upon it. And there a stone from the Roman Colosseum, A.D. 87, and another from the Great Wall of China. And so on down the ages—stones from the Stabian baths in Pompeii, from the cave of the Sibyl at Cumœ from Ænas consulted before his descent into Hades, from Rouen cathedral, A.D. 1220, from St. Peter’s at Rome, from the Clementine hall in the people’s palace, from the Tainitzkaya tower of the Kremlin, from the battlefield of Bunker Hill, from Fort Sumter against which the first shot of the first civil war was fired, seashells embedded in the fragment, from Douglas Hall—1856—of then old University of Chicago, and from our great World’s Fair of 1893. That vivid way of touching history to life was first tried on the walls of the Tribune Tower and it has been a success. Passersby, young and old, pause for minutes to study the silent but not voiceless relics. The instant you step from the avenue into W-G-N’s fairyland silence is laid upon you like a cool cloth. Everything every step of the way is soundproof. Every door is felted and every door air controlled. They close with a soft whisper. Corridors are noiseless to the footfall. Those corridors lead to rest rooms and smoking rooms for artists and visitors, to clients’ room and executives’ offices to a chamber for organ recitals, to music archives containing thousands of compositions, and to air conditioning lofts. At the touch of a button grand pianos noiselessly disappear from the main platform. Note the large glass window in the south wall of the “business lobby”—as distinguished from the main studio auditorium lobby—which opens off the lovely connecting cloister. That window is set with a novel composition called brick glass. Every brick is four inches thick and contains a vacuum, thus keeping heat out in summer and heat in in winter. New machinery had to be built for the fabrication of the special types of brick we ordered. It admits light beautifully, but is not transparent. See that drapery of eggshell white velvet that hangs behind the platform of the main auditorium. It is 48 feet 4 inches wide and 29 feet high. It can silently move forward like a white cloud, thus cutting the depth of the stage in half and permitting a more intimate show. Touching a button makes it move. Look aloft to the silver ceiling of the principal auditorium—the room that will be thrown open to The Tribune’s guests this morning—and there you will see a ponderous panel that moves noiselessly to reveal a battery of ten spotlights, each light equipped with a wheel containing five colors that descend upon the exhibition platform like a Niagara of rainbows. W-G-N’s new station can take parts of its shows from eight different microphones controlled individually or by one master control. This is the largest installation of the kind that our people know of. From the master control room on the station’s second floor, W-G-N has wires running to the Chicago Board of Trade, the Drake, the Blackstone, the Aragon and Trianon ballrooms, and the Palmer house which are called “remote control points.” These wires are leased from the telephone company by the month at so much a mile, and are bound in one telephone cable capable of giving us a hundred pairs of circuits. Their purpose is to bring in programs that originate outside W-G-N’s studios. There are also emergency cables to be used in case of floods or a street accident. The builders took measures to meet the demands of every emergency. By a system of dialed electrical boxes Tribune executives and clients can dial from offices in Tribune Tower into the main control room of the station and instantly hear any one of eight programs of our own or other stations. “Yes, indeed,” said I with the polite mendacity we dumb laymen display when a technical enthusiast speaks. The latest sound insulation devices such as transite, which is a composition of asbestos and cement, and rockoustile, which comprises cork, mica, and cement, and others so new that their names are not yet in the dictionaries, were explained to me as they may be to you. But all that, like the telephone devices and the air cooling devices, was such highly specialized stuff that my principal interest in it was observing the rapturous reactuon of the staff to it. In other words, my interest was in the men and women of the staff, on both its technical and its art sides. They are alert. They speak many words, but short ones, and they release them rapidly. They are working in a new world and they face some fresh problems, some glad, some unexpected opportunity every day. The Story of W-G-N Call Letters. The story of the call letters W-G-N is interesting. Those letters came from the The Tribune’s slogan, “The World’s Greatest Newspapder,” and the W-G-N call initials were acquired from Mr. Carl D. Bradley, who was operating a coal carrier, named for him, on the Great Lakes. 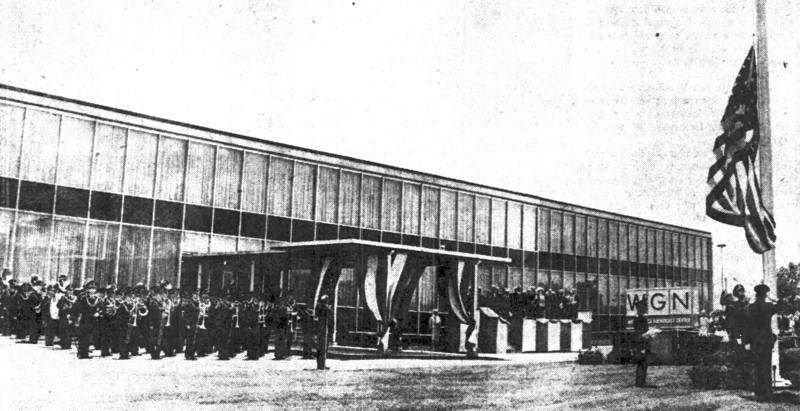 In March of 1924 the call letters were established as those of The Tribune’s radio station and the opening of The Tribune’s station on the Edgewater Beach hotel—old station WBEH—came on March 29, 1924, with the new call letters W-G-N going out to the world for the first time from an entertainment radio station. The ship owner relinquished the letters as a courtesy without argument, as the ship was not in service at the time of the transfer of letters, but was wintering at a Michigan port. The Tribune has been vitally interested in radio broadcasting almost from the inception of that art. 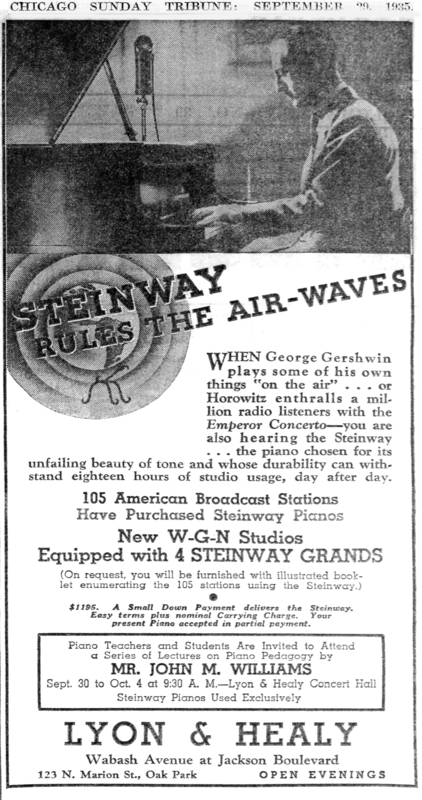 As long ago as December, 1921, negotiations were begun between KYW, the first Chicago broadcasting station, and The Tribune with reference to The Tribune’s entrance into radio broadcasting. These negotiations with KYW culminated in January, 1922, with the inauguration of regular programs of current events, stock market reports, and sports summaries, which were furnished by The Tribune and broadcast over KYW as Tribune-Westinghouse programs. Due, however, to dissatisfaction on the part of The Tribune over the territory covered by KYW, this arrangement was discontinued. The genealogy of W-G-N extends back to May 19, 1922. On that date station WDAP, then owned by the Midwest Radio Central, Inc., was first licensed by the secretary of commerce to operate with the most power then allowed, 1,000 watts. A year later WDAP was purchased by the Chicago Board of Trade and subsequently by the Whitestone company, owner of the Drake hotel, Chicago, on top of which the station was located. From the Whitestone company The Tribune acquired WDAP in 1924, when the call letters were changed to W-G-N. 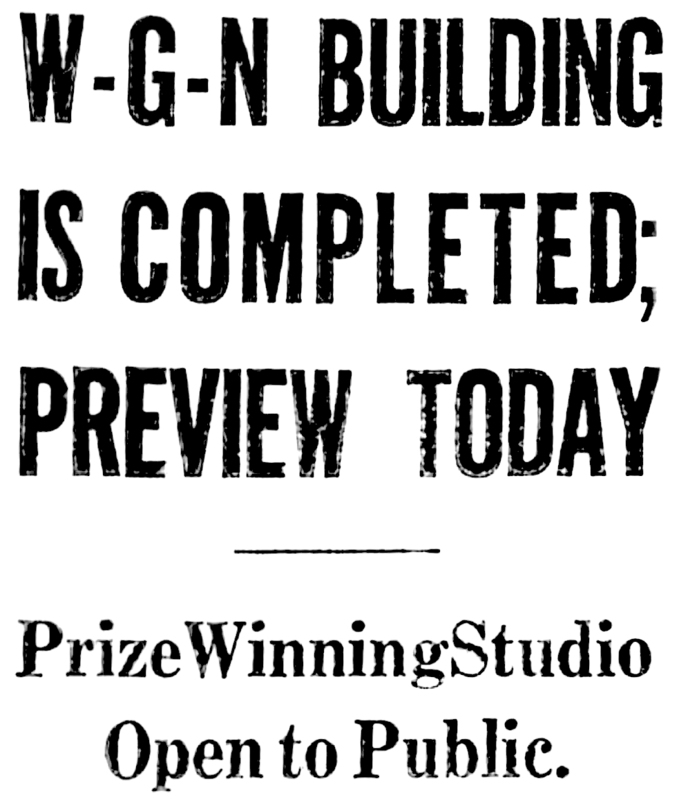 The license issued by the secretary of commerce to The Tribune on July 15, 1924, changed the call letters of station WDAP to W-G-N and authorized the use of 1,000 watts of power. The Tribune operated station W-G-N on the Drake hotel under this lease until Jan. 11, 1929, at which time it purchased the apparatus and equipment. On Oct. 2, 1925, The Tribune and its subsidiary, Liberty Weekly, Inc., purchased from Charles A. Erbstein two broadcasting stations, WTAS and WCEE, both located near Elgin, Ill. WTAS at that time operated with 2,500 watts power and WCEE with 500 watts. The call letters were changed from WTAS to WLIB on the one station, and W-G-N and WLIB alternated on the samed broadcast channel, 990 kilocycles, until in 1927 they were shifted to the clear channel of 980 kilocycles and five months later to the cleared channel of 720 kilocycles upon which W-G-N is still operating. On Oct. 2, 1926, a new transmitter using a power of 10,000 watts was placed in service. On Nov. 3, 1928, W-G-N commenced using 25,000 watts of power. The consolidation of the three stations, W-G-N, WLIB, and WTAS, into one station, W-G-N, was accomplished on Sept. 26, 1928. On Oct. 16, 1928, the federal radio commission issued a license to the consolidated stations under the call letters of W-G-N, authorizing the use of full time on the channel 720 kilocycles. 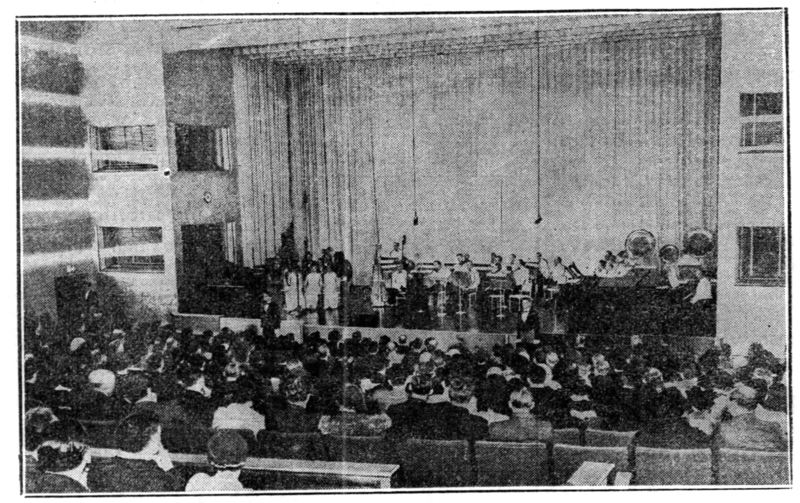 On March 29, 1934, the new 50,000 watt transmitter of W-G-N was put in service with a gala two hour program for the public in the grand ballroom of the Drake. The celebration continued for another three hours via remote control programs. In fine, W-G-N has acquired all its wave lengths by purchase and not by favor or influence. It wears no governmental collar. A feature of the new home of W-G-N which will interest our visitors from the art world is the mural adornment of the four main studios. Each one of them was decorated from prize winning designs in the $5,000 nation-wide competition. Hence their variety, their arresting originality, and their racily native spirit. 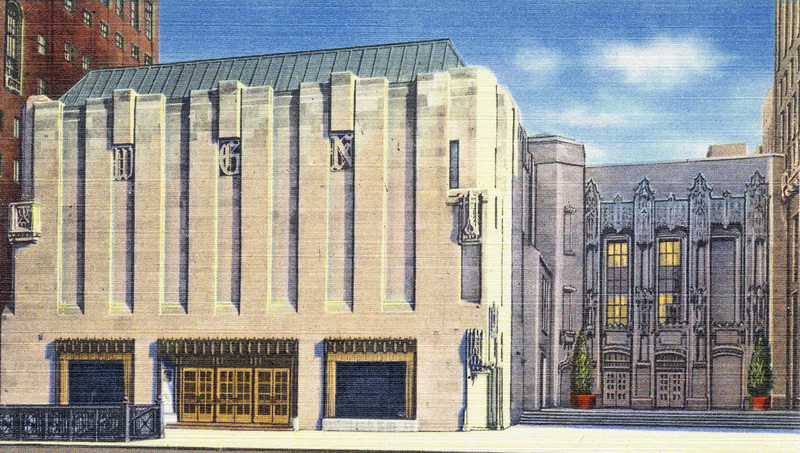 The first public performance in the cathedral of radio will be given on Thursday evening, Oct. 3, and special performances sponsored by The Tribune will continue till Sunday evening, Oct. 6. The main auditorium of the new W-G-N building, adjoining Tribune Tower, which will be shown a preview from 10 a.m. to 2 p.m. today. The seats are morocco red, the walls powder blue, with bands of light, the ceiling and platform abutments in silver leaf. Workers who built the new W-G-N radio building were the honored guests last night at a two hour dedication program in which they were introduced to something of the mysteries of this radio world which they had housed so beautifully in silver and blue and softly changing colors. Half of the 550 engineers, artists, and artisans who have worked for 276 days on this structure which combines the latest technique of the radio laboratories and the enduring beauty of stone that has been characterized as “frozen music” were there last night with their families. The others will be given a similar program tonight. After that the building will be given over to the public. This means more than just giving you the first show here. This is a celebration where you in front turn over this building to the people on the stage. You have set a high standard of excellence which those on the stage must live up to. This is your triumph this evening. There are triumphs in peace no less than in war. This victory of peace has a sadness for me, for it means I must part from the men I have watched at this building for the last year and a half. I have seen you working so silently, so carefully. You have piled atone on stone, color on color, and joined wire to wire. You have built here, forever, something that your children will thank you for. You leave me with emotion. God bless you and be with you always. The idea of opening a building first to those who built it was one that could be considerably farther, Co. McCormick remarked to his audience, which sat back in the wide, well padded red morocco chairs and listened to the music of two orchestras and many singers. The workers might be given the first show in a theater, he said, or the first dinner at a restaurant \, the first night in a hotel, the first day in a hospital, or even the first service in a church. The trades represented, all union men, ranged from hod carriers and laborers to the painters and stone workers. 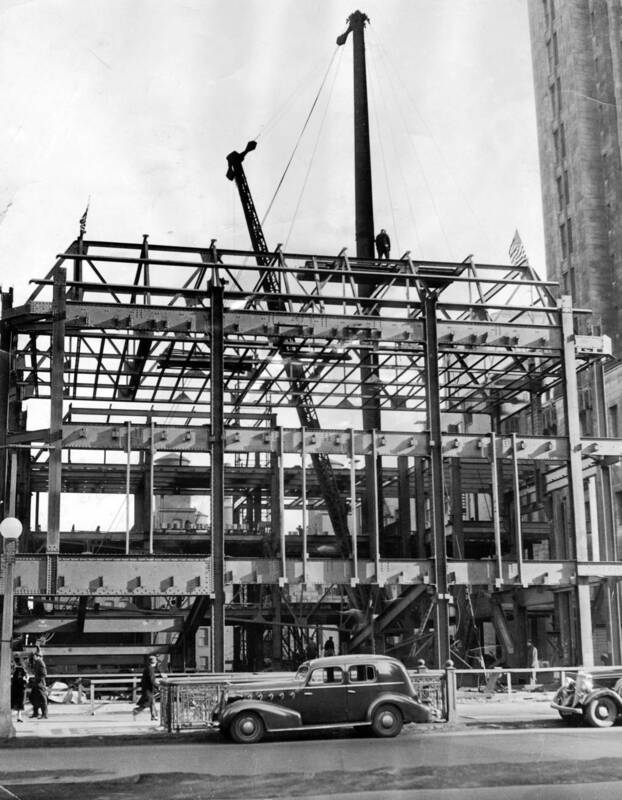 They included iron workers, concrete workers, masons, carpenters, electricians, plumbers, steam fitters, sheet metal men, acoustical workers, roofers, tile setters, glaziers, terrazo men, rubber and cork floor men. Henry Weber conducts the Chicago Theater of the Air orchestra over WGN radio. The completed room in which they sat in more than 500 seats was a jewel box of an auditorium with silver ceiling, powder blue walls, with bands of light running across them both as decoration and as light. The great platform was large enough to hold a symphony orchestra, with three black grand pianos, was filled with members of two orchestras last night, the W-G-N concert orchestra and chorus conducted by Henry Weber and the W-G-N dance orchestra directed by Harold Stokes. Only the electricians understood the technicalities of the sound arrangements. It appeared to the audience as though the players and singers were performing directly to them, but they really were sending their tones through seven microphones which swung and stood about the platform, and sent the golden notes down over the heads of the audience from concealed amplifiers. The same sounds were sent over the Mutual Broadcasting system for the entertainment of the unseen audience. There may be better acoustics and sound technique, but if so the engineers and planners of this building were not aware of them. They consider this a challenge as well as a triumph. No other building in the United States has been so perfectly adapted to the exclusive use of radio. Not the least of the amazing evening was the play of lights upon the platform, which had its back drop a velvet drapery of egg shell white. This took on, from some unseen source above, all the colors of the spectrum during the evening, the lights playing with the music in a combination of sound and color. The dresses worn by the women singers were of the same egg shell color and when they sang of the moonlight, or the sea, or of love, colors of rose and sea green and mysterious blue of midnight skies hovered above them and glorified them into forms almost unreal. The first hour of last night’s entertainment, which began at 8 o’clock, was arranged only for this audience of workers. It was not broadcast. Morrison Wood was the production man in charge of this and Blair Wallister was in charge of the second half of the program. The order of these programs will be reversed tonight. Harold Stokes, in white flannel, directed his orchestra of twenty pieces. The men were dressed in white dress jackets, with black trousers. Roy Atwell, comedian, kept the audience laughing at intervals. The singers were Ronnie Mansfield, the Doring Sisters, the Grenadiers, Sally Jo Nelson, Kenny Strong, Barbara Parks, Lawrence Salerno, and Pliner and Marlowe, a dual piano team. 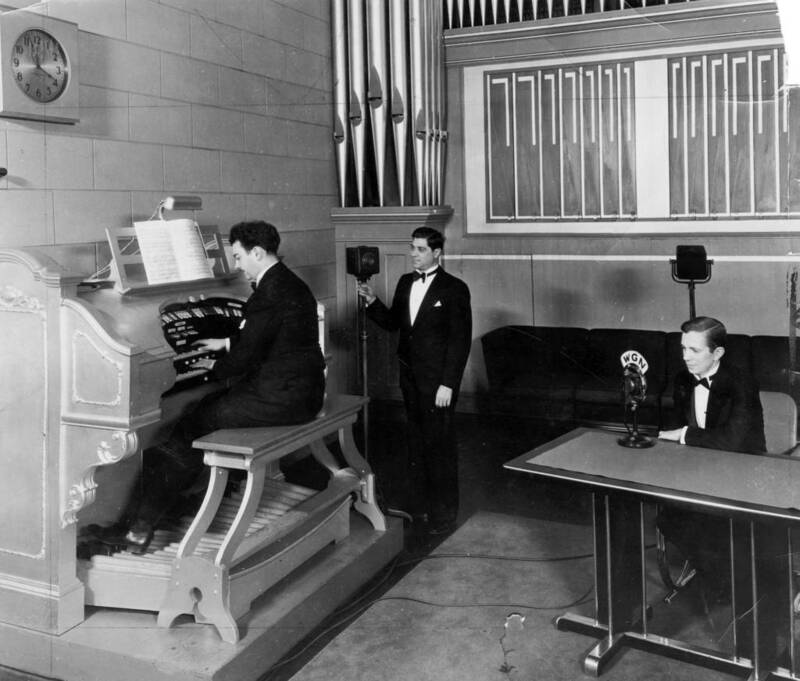 Sending organ music over the radio waves from the studios of WGN. We will now return to the W-G-N studio. Mr. Ryan told of the development of this station since the early days of radio broadcasting in 1921, the history of the call letters and how the power of the station has increased steadily to 50,000 watts. He gave the signal for the start of the program and introduced Col. McCormick to the audience. It was Col. McCormick’s idea, he said, that the dedication program should be given to the men who put up this building with their and fashioned its wonders out of blue prints. During intermission the guests visits other parts of the structure, the smaller studios, the control room, the artists’ room, library, clients’ toom, etc. The lobby of the building was filled with flowers. One of the largest pieces was sent by James C. Petrillo, head of the Chicago Federation of Musicians. On behalf of the city of Chicago, I am very happy to tender my most hearty congratulations on the opening of W-G-N’s splendid new radio station. Tonight’s occasion not only marks the achievement of the cherished dreams of yourself and your entire organization but it accents Chicago’s spirit of progress, and on this point as mayor of Chicago may I also express my deep appreciation for your constructive action? I wish you an abundance of success with your new enterprise. NEW HALF MILLION DOLLAR W-G-N STUDIO IS FORMALLY OPENED—View of the interior of the new radio broadcasting plant north of the Tribune Tower during the opening program last night, given for the entertainment of the men who built the structure. The control booths are at the left and the observation booths at right. Six of the 14 new studios in the multi-million dollar W-G-N building nearing completion in Tribune Square have been put into service. All incorporate the newest and finest developments in studio design and equipment. Several features are unique. Of the 14 new studios, seven will be devoted exclusively to radio broadcasting, four will be for television only, and three will be used for both radio and television broadcasts. All studios incorporate a “floating” principle. Each is separated at the walls and ceiling from the building proper by air gaps of 2½ inches, and floats on rubber bags inflated with air. This technique effectively insulates the studios from all outside noise and vibrations. A studio of matchless design and mammoth proportions is 5A, which might be described as an outdoor bandshell transplanted indoors. Three stories high at the back, it tapers down to 1½ stories at the “bandshell” end. It is designed for broadcasts by symphony orchestras and large bands and for productions of the scope of the Chicago Theater of the Air. No acoustical sound absorbers have been used in the bandshell area because the studio was designed so that sound coming from this area would be projected toward the “open” section, which represents “outdoor space.” The “outdoor” area is walled with highly absorbent acoustical material covered by perforated cement-asbestos board. The bandshell end has splayed walls and ceiling of plaster. Fluorescent lights are placed in the coves created by the splaying. These are augmented by numerous, overhead incandescent floods and spotlights, which give exceptional lighting to the studio. The architectural treatment of this studio, 41 by 70 feet in dimensions, is modernistic. Decoration is in soft pastel shades. On the floor a half-inch of ground cork is topped by a layer of light grained beechwood. The floor is cemented down; no nails were used. The result is a quiet floor with no squeaking. To make this studio, which will be used both for radio and television broadcasting, as flexible as possible, no permanent seats have been installed. Portable chairs for 250 studio guests can be set up. Studio guests, particularly at the broadcasts of the audience participation show, Ladies Fair, were intrigued by the 40 inscriptions in wood blocks on the walls. These include humorous and sage quotations, some old enough to have become classics, and others of recent origin. “It might have been worse, it might have been Vandenberg.”—Col. Robert R. McCormick. “I always make it a rule to get there fustest with the mostest men.”—Nathan Bedfor Forrest. “In rivers and governments the lightest things swim at top.”—Benjamin Franklin. “Cease firing, but any enemy planes appear, shoot them down in friendly fashion.”—Adm. William F. Halsey, Jr.
“Everybody is ignorant, but on different subjects.”—Will Rogers. “Too many people don’t care what happens as long as it doesn’t happen to them.”—William Howard Taft. Tom Moore preparing to conduct his Ladies Fair program in W-G-N studio 5-A, one of six new studios now in service in addition to Tribune Square. Eventually, there will be 14 new studios in the building. A clients’ booth, accommodating 25 persons, overlooks studio 5A. Dual plate glass windows in the control room are tilted 10 degrees off perpendicular. This tends to break up sound and light waves that might cause unwanted reflections and vibrations. Additional power and lighting facilities are provided in this studio for possible television use later. 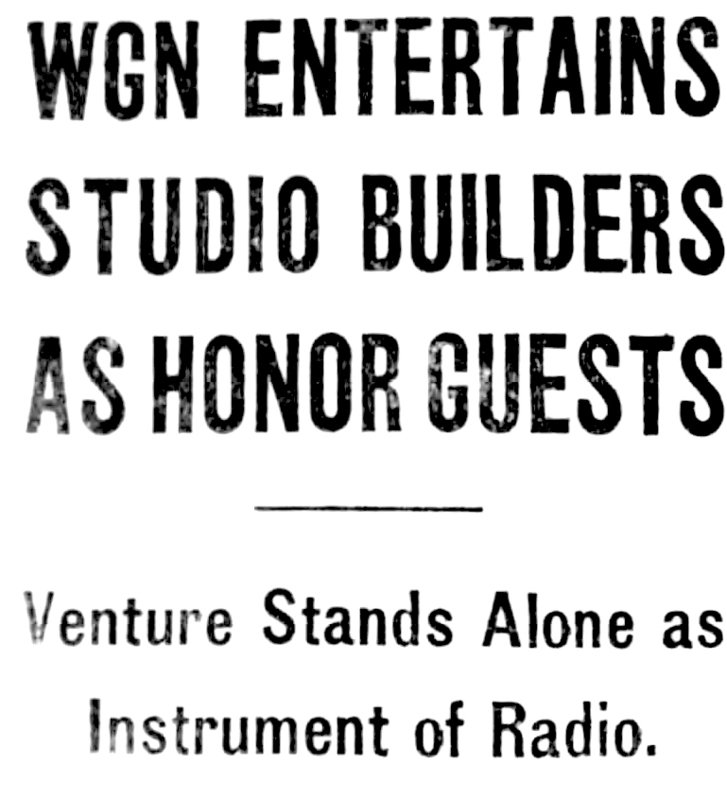 Studio 6A, already in use for WGN-TV telecasting, was described previously in The Tribune. Another unusual studio is 6B, a music and organ studio. Then organ installation alone cost $50,000. Only the console at the far end of the studio is visible. Pipes and shutters have been concealed behind a perforated wall, creating an illusion of sound permeating the studio from innermost recesses. This studio, 33 by 45 feet, is two stories high. The walls have been given a splayed wing treatment with a cylindric relief, and modified by a wainscot in picket effect to compensate for minor acoustical deviations. The floors are of beechwood, similar to those of 5A. The organ has three manuals, thousands of pipes, 112 stops, and a full percussion department. It can emulate tones of the loftiest cathedral organ. 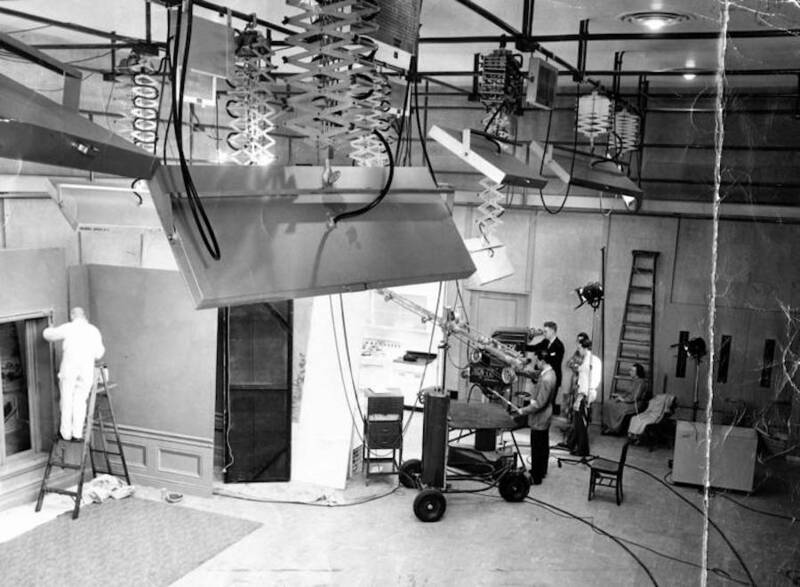 A view of the floating television studio in WGN’s building, in Tribune Square, which began operations on Jan. 25, 1950. The studio is 34 by 52 by 22 feet and floats on inflated rubber bags. Air space is provided between the walls and the ceiling and the building proper to eliminate outside noise and vibrations. 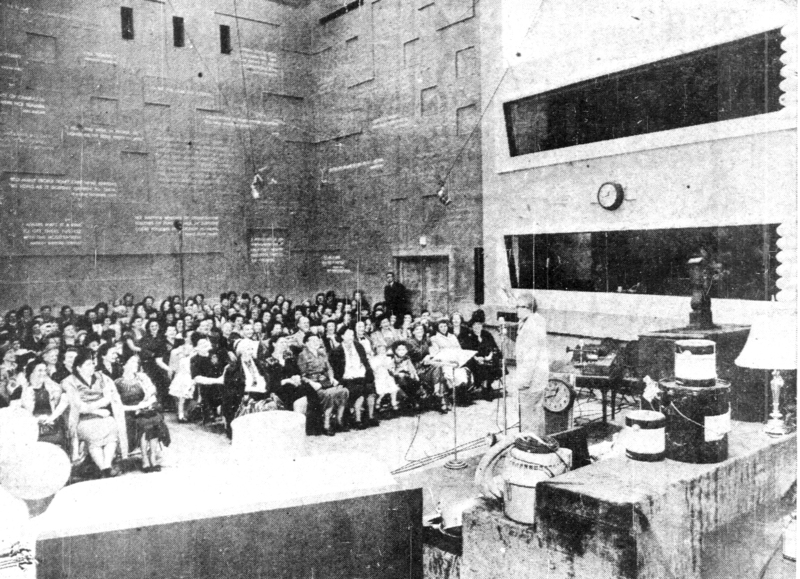 Studio 3A, modern in design, was planned for musical ensembles, small groups of talent, or individual broadcasters. It is being used temporarily as an announcers’ and stand-by studio. Pholycylindrical, blonde wood walls rise above dark dark metal trimmed wainscot. These help to blend sound waves for the most pleasing effects. Decorative recesses in the acoustical canopy provide bot incandescent and fluorescent lighting. The two other studios in operation are 3B and 3C, identical in size, construction, and modern treatment. They also were created to accommodate musical ensembles, small groups or individual broadcasters. They are 18 by 27 feet. The acoustical blanket lining each interior is decorated in blended tones of pastel tan, brown and rose. Polycylindrical panels relieve otherwise plain walls, adding eye appeal as well as contributing acoustical control. W-G-N’s main audience studio on Michigan av. is being remodeled and will not be ready for use as a combination radio and television studio until next fall. The Chicago Theater of the Air’s operatic performances are now being broadcast from 5A, but without a studio audience. LEFT: Frazier Thomas with the puppets Garfield Goose and Beauregard Burnside III with Thomas’ son Jeff, 5, behind the camera at WGN-TV studios in 1958. 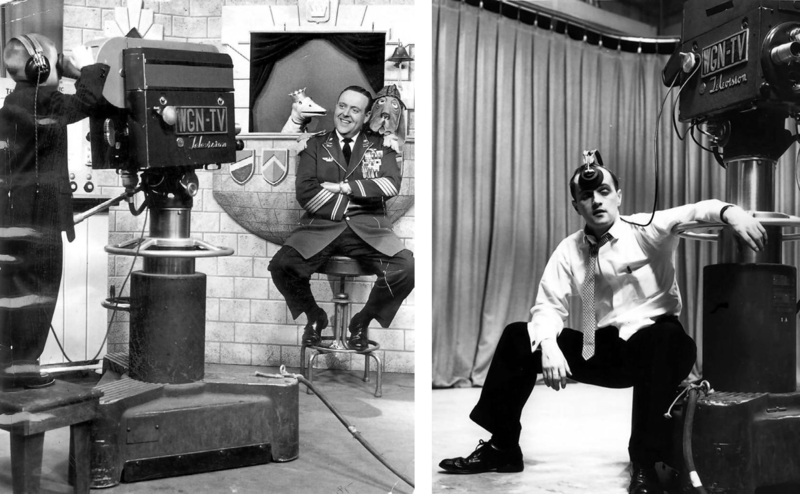 RIGHT: Bob Newhart hams it up at the WGN-TV studio in 1960. W-G-N and WGN-TV began moving from 441 N. Michigan av. to their new home at 2501 Bradley pl. yesterday. Live telecasts from the new north side broadcasting center are scheduled to begin Monday. Color equipment from WGN-TV’s studio 7A was dismantled at the completion of the Garfield Goose children’s program at 5:45 p.m. It is to be installed in the new building in time for Monday’s telecast of Treetop House at 12:30 p.m. Treetop House, also a children’s program, is to be the first program telecast from the new studios. Station representatives expect an orderly transition with no interruption in radio or television programs over the weekend. Preparations for transferring staff and equipment have been underway for months. The move is to be completed Wednesday. Scene at W-G-N’s new Mid-America Broadcast center at 2501 Bradley pl. yesterday as soldiers of color guard raised the Stars and Stripes during dedicatory ceremonies for the big $3,500,000 radio and televison studio. Fifth army at attention at left. 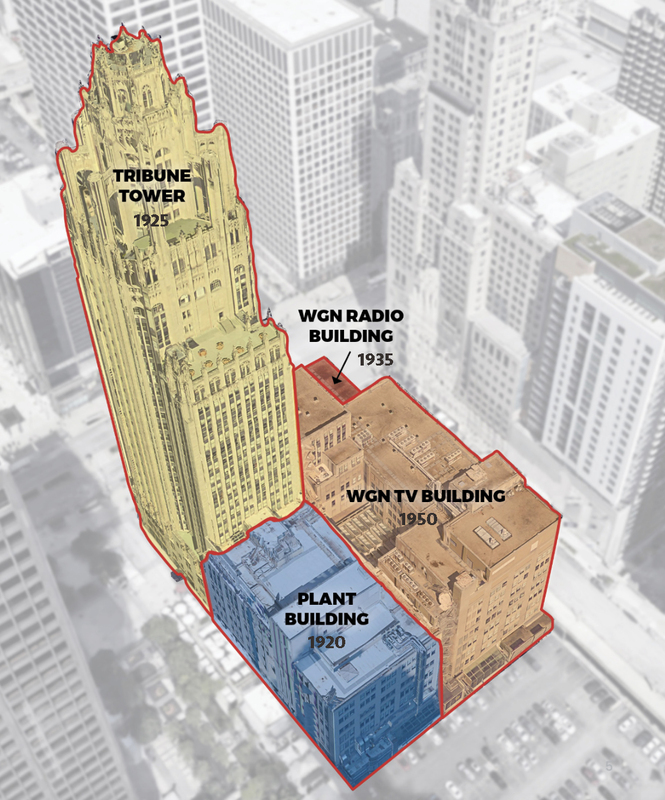 Modern facility replaces W-G-N and WGN-TV studios and offices formerly at Tribune Square. 1 The top headline is the announcement of the opening of the studio from the September 29, 1935 issue of The Tribune, while the following sub-headline and story is about the actual program following it’s opening on October 1.